Welcome to the San Juan Islands online directory covering Lopez Island, Orcas Island, and San Juan Island. 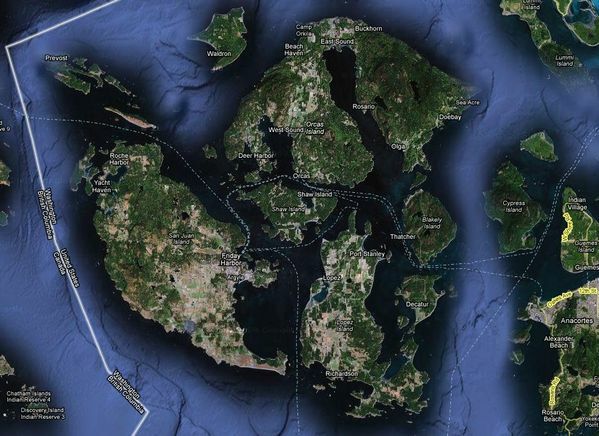 Just 80 miles north of Seattle and 40 miles south of Bellingham, lay the San Juan Islands. Visiting the San Juan Islands is as simple as driving onto the Washington State Ferry or hopping onto a seaplane. A natural and cultural destination for Washington State, the San Juan Islands should be on your "must do" list when you visit the Pacific Northwest. Lopez Village on Lopez Island, Eastsound on Orcas Island, and Friday Harbor and Roche Harbor both on San Juan Island are all worth a visit. Lopez Village is by far the smallest and Friday Harbor is the largest. Galleries, fun houses, seafood restaurants and funky coffee shops abound. Excellent beachcombing, hiking, sea kayaking, and whale watching can be had on each of the islands. Unique museums and historical tours are also on the menu. Several award-winning bed and breakfasts, hotels, resorts, and vacation rentals can be found here in the San Juans. Many visitors choose secluded bed and breakfasts while others prefer full-service resorts. Vacation rentals are popular among groups, weddings, and family reunions. I stopped into this coffee shop on a Wednesday evening and snapped off some photos to show you what the place is like. Free WiFi, right next to the ferry landing, good prices, and a good selection of caffeinated beverages as well as ice creams, fresh juices, sandwiches, wraps, and pastries. Madie and Wes discuss the upcoming Cider and Mead Festival to be held on the Village Green in Eastsound Village on Orcas Island.